Hey Look at what I won! Not going to scoop this ultra cool contest, visit Mary Forney's blog. She was my best The Pamplemousse bud last season and is a favorite of mine! 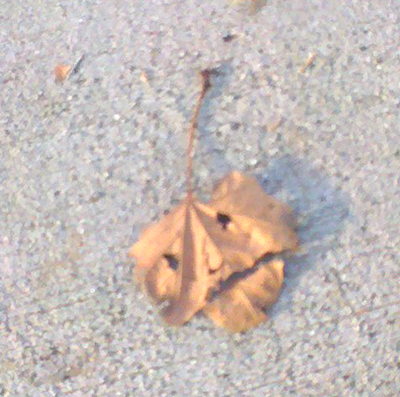 I saw this leaf yesterday morning and wondered what it was telling me. Day 5 of jury selection and I knew: I was released from this dreadful trial and wouldn't have to spend any more days looking at the back side of skull tattoos or the sleeping attorney. Four accused of extortion and homicide. Four defense attorneys, one d.a. About 80 prospective jurors for all five days of jury selection and started with more than 100. Very unusual to have such a big jury pool but they knew people were going to resist this case. Early on I'd expressed my general revulsion for skull tattoos, but Jon was sure they'd keep me on the jury for who knows what reason. The trial is expected to run three weeks at least. The judge who sits up so high on his throne in the court room and was quite personable turned out to be a teenser fellow in person. Today I dressed in the weirdest combo I could put together and horrified Jon as I walked out the door, but it wasn't the clothes that got me excused, I was already on the big list. YAY HOORAY! Everyone who got excused looked incredibly happy while waiting for their get out of jail passes. Actually I think a criminal trial like this could be really interesting, but the obvious local gang angle scared me. Molly and I had a surprise walk with our best German Shepherd friend and her dog Tilden at dawn, then we went to the Farmers Market and my bud tasted her first cherimoya, which is a wondrous fruit if you've never tried it. Without doing my usual frantic handicapping, Jon and I headed to Santa Anita because I wanted to try to find the statue in Mary Forney's contest. A season pass to the Clubhouse is an exceptional prize, and I was sure I knew where the little horse statue would be hiding. The hint was that it was amidst some potato chip displays. 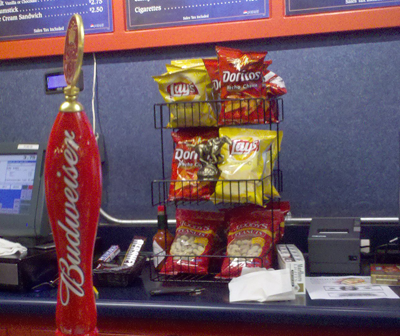 Do you know how many kiosks and cafes at a giant racetrack sell potato chips? Between races I scurried here and there looking for the statue. The food stand person would say to me, "May I help you?" "No, thanks, I'm just looking." How pathetic, just looking at the potato chips. I thought we'd found every possible display of chips but then we went into the paddock room, where I'd never been before, a basement area filled with people, and there in the corner was one more potato chip display. And what was that? The little statue. I was so excited that most of the pictures I took with my phone were impossibly blurry. I emailed one to Mary. I won the contest, I'm going to get my season pass! For someone like me, this is worth hundreds! Every bet I placed was wrong until the 5th race when I bet on the horse Chantal Sutherland was riding to win, and in an exacta. She won. I won. The exacta too. If you haven't seen Chantal Sutherland she is incredibly pretty and has a goofy website. I believe she used to be a flight attendant. She's Canadian and has a bit of Princess Diana about her. (be sure you see the first image on the site). She's a really great rider and has just returned to Santa Anita. The woman next to me said, "Oh yeah Chantal beats the snot out of the guys every time." euw. Not exactly Chantal's intended image. The same lady told me my jacket was worth at least $800. Jon's been trying to get me to throw it away. It does have a few stains. euw. Down at the actual paddock we stood next to a friendly young woman who was about to start photographing the horses coming into the circle. We made some jokes and she said she was practicing taking pictures because she wanted to go to Kentucky to take pictures of horses breeding. Um, do you mean like, -breeding? Oh yes, she said, and you have to be very fast with your camera. Jon said, "Maybe you can sell those pictures as a calendar, with Chantal photoshopped in the background." We left after I had my wins. Great day. It is such fun to search for something in a contest and find it. This afternoon I go for jury selection, which should be interesting. I just added a feature to my blog on the left side. It's something I've wanted for a while, a random replay from posts in the past. It can be daunting when you visit a blog for the first time, to decide whether it's worth your time to read more, and this little feature can give you a nice (or not) random sampling. I got it here and it was just a click through to install. 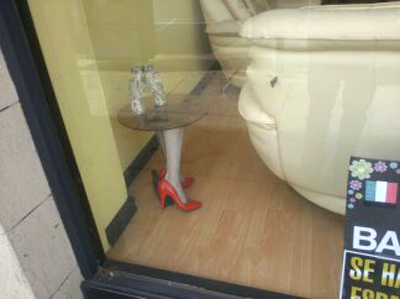 This legs table was in a bail bonds window near the courthouse. Wacky weekend around here but now we're grounded because the biggest rain of the season is supposed to slam Los Angeles all week. We'll see if that's true. It's raining now and still dark out. Glad I'm in the middle of "Gone with the Wind" which I'm enjoying. All last week I dutifully called in to see if I had to report next day for jury duty. Thursday night I thought I'd gotten off the hook for at least a year, but no, had to show up at 8:30 the next morning. Spent the whole day reading "Gone with the Wind" in a big room with several hundred unhappy people. Around 3:15, when the room was nearly cleared out, they called the last group of potential jurors and we shuffled across the courtyard and upstairs to room F in the criminal court building. The judge asked for a juror pool of more than 100 people for one case. That's unusual. If I get chosen I can't say more about it, but they aren't doing the selection until next Thursday. We (last jury pool group) sat in the courtroom behind the FOUR defendants accused of extortion and murder. Two had big shaved heads and skull tattoos, and two were Russian looking in leather coats. Central casting! Do you suppose their appearance might affect the outcome of the case? It's like with Phil Spector- why didn't his lawyer tell him not to wear the Bozo Clown fright wig to trial? That wasn't his hair. When he checked into jail he just had a little flat hairstyle and looked like an old retired raisin. Then to add to weekend fun we took a quick trip out to Santa Anita and watched some horses run, came home and went to the Golden Globe party given by Paramount. I was on the guest list- insane, we don't know why. I thought I'd post my twitter tweets. Many people are bewildered by twitter but I enjoy it and it doesn't track you the same way Facebook does. The 140 maximum letters per post make it challenging but more fun. A weird thing on twitter if a person is trying to tell a story is the sequence is backwards since you read the last post first. we only stayed for four races cause we're going to Paramount's Golden Globe party tonite woowoo. Told hub to bet Rummysecretwar - good..
also me & hub & Robert deNiro who looked very confused. We stood at side door & watched the stars get wrangled in. Actors smoke a lot. Party Food: macn cheese, paella, eggplant dish, filet mignon wrapped in bacon, sliders, mystery puffs and a tower of mini cupcakes. I ate 3. Just realized the weird guy with the icky face tattoo we stood next to last night at the Golden Globes Paramount party was Mike Tyson. Somehow I only managed to identify the guy celebs, but there were many gorgeous women there too. The oddest dress was an absolute lampshade style. Strapless white bouffant with a ruffle on the bottom, which barely covered the bottom. The slightest move and you saw her black underpants. No lightbulb underneath. There was a pretty strict no photos policy at the party, even outside with the line of valet parkers. With cel phones they can easily pop a shot just like a papparazi. Here's a link to a gossip report on the party. 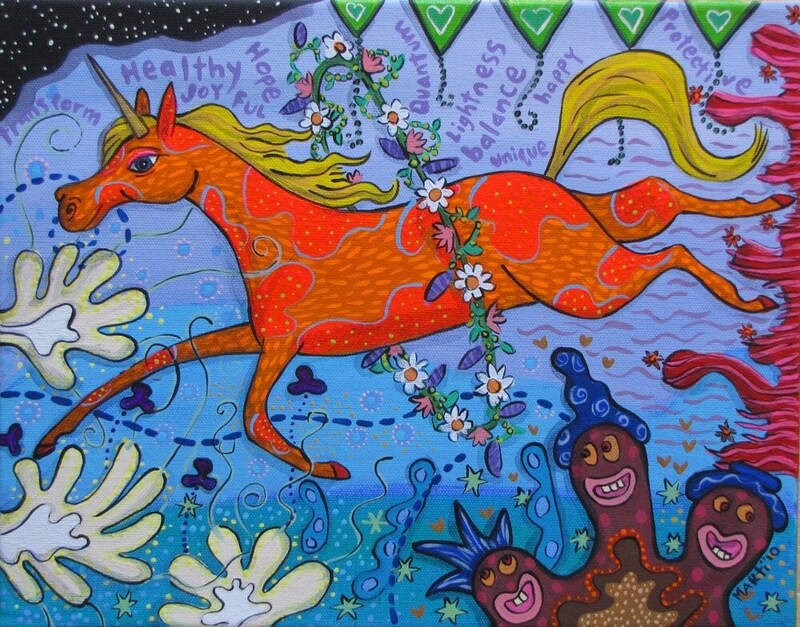 Marti McGinnis painted this exquisite lyrical magical picture for my niece Allyx, who's enduring the toxic treatment required to defeat Hodgkins Lymphoma. Marti writes about it here. There's so much depth to this joyful picture- I adore it. Thanks, Marti! You are a wondrous talent! Spoke to my mother this morning: she was up on deck and had been fishing all morning but no interesting fish had been caught. She said, "How are the horses running for you?" Wow, she remembers that my latest obsession is horse racing. I said, "I've been making lots of money." "Oh, honey that's wonderful. I don't know how you do it. But don't forget, the worm turns." I said, "I hear Cricket and Cousin John are both on the ship." She said, "I don't think so. I haven't seen hide nor hair of them." It was time for her to go below deck, so we hung up for today. It does seem like she's having a pretty good time on this cruise of hers, and she maintains the reality of it every day which is quite an accomplishment. I'm taking a break from the blog, not sure how long. Nothing to worry about. Just feeling a little overwhelmed.